For the seven years I was a public school teacher, I spent much of the month of August preparing my classroom. I frantically painted walls, wrote names on desk tags, behavior charts, and baskets, and hung up brightly colored posters and signs. So much concern went into preparing the “best possible” learning environment, but not much effort went into preparing the learning atmosphere. At that point, I had never considered education as an atmosphere. During my first year at Ambleside School, that panicked August feeling rushed over me. But thankfully I was told, “Don’t worry too much about setting up your classroom. Spend your time praying, learning the philosophy, and preparing.” This was such a welcome relief! The ideas I put into the atmosphere, the peace that I emanated, were more important than the stuff I did. Now, I try to transfer that idea to my own home atmosphere. When I wrote about Charlotte Mason’s 4th principle, I mentioned all of the things that we should not do to educate and discipline our children. But she said that what we should do is to view education as an atmosphere, a discipline, and a life. Moms, much of the home atmosphere rests on our shoulders! I hope that this post encourages you as we set out to create a home atmosphere where children grow in character and wisdom. Our home environment affects the atmosphere, but “atmosphere” and “environment” are not one in the same. In the decades preceding Charlotte Mason’s work, people believed that setting up a pristine child-environment would teach them about conduct and beauty. But Charlotte Mason said that the home atmosphere is not only shaped by things, but by people and events. Through these, ideas fill the home and our children’s minds and hearts. Our physical homes, daily activities, and the words we speak teach our children what is valuable. We are the home atmosphere. There are many important aspects of home-life from first training to highest education; but there is nothing in the way of direct teaching that will ever have so wide and lasting an effect as the atmosphere of home. And the gravest thought concerning this is that in this instance there is nothing to learn and nothing to teach: the atmosphere emanates from ourselves–literally is ourselves; our children live in it and breathe it, and what we are is thus incorporated into them. There is no pretense here or possibility of evasion; we may deceive ourselves: in the long run, we never deceive our children. The spirit of home lives, and, what is more, is accentuated in them.” Vol. 8, no 12, 1897. I hope this idea doesn’t fall on you like a weight. There is already so much pressure on moms today, but maybe the pressure is firmly pressed in the wrong place. Instead of worrying about what activities to keep our children busy with, maybe we should instead worry about creating a home atmosphere that they want to be in. Let’s ignore the pressure to fabricate a picture-perfect childhood for our children, and instead teach them responsibility and give them ideas that will inspire them to grow in maturity and love. Creating a positive home atmosphere has more to do with who we are than what we do. If we want to teach our children to love Jesus, we fill our homes with hymns and prayer and Bible reading time. To teach children generosity, we drop change in the bucket and give without hesitation. For children to learn gentleness, we need to watch our tone and our reactions in situations that aren’t ideal. This learning atmosphere is created by how we go about our real lives, day in and day out. Maybe you are your own friendly ally- preparing the environment to help yourself succeed. This might be reminders written around the house, or physically changing things that cause problems in the home. Maybe keeping a journal helps you to hold yourself accountable. A friendly ally could be a real friend that you can meet with regularly to discuss how you are doing on your journey. There is also a Facebook group called Charlotte Mason Moms- Habit Training Ourselves that is a great place to seek out support and encouragement! 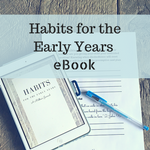 Another great resource is this free eBook from Simply Charlotte Mason, called Education Is. I think it’s important to note that education is not just an atmosphere. Education is also a discipline and a life. Establishing a positive home atmosphere will not constitute an entire education, but it will be a part of the complete, beautiful process of learning. Subscribe to our newsletter so we can send you your 20 principles study guide right away!